Tamara Korpatsch (born 12 May 1995 in Hamburg) is a German tennis player. Korpatsch has won five singles titles on the ITF tour in her career. On 22 May 2017, she reached her best singles ranking of world number 130. On 8 May 2017, she peaked at world number 723 in the doubles rankings. Korpatsch made her WTA tour debut at the 2016 Ladies Championship Gstaad, partnering Ekaterina Yashina in doubles. 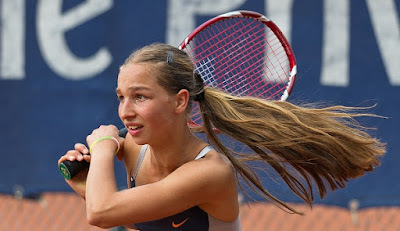 Anna Nikolayevna Kalinskaya (Russian: Анна Николаевна Калинская; born 2 December 1998 in Moscow) is a Russian tennis player. Kalinskaya has won four ITF singles and six ITF doubles titles in her career. On 22 May 2017, she reached her best singles ranking of world number 132. On 6 March 2017, she peaked at world number 124 in the doubles rankings. Kalinskaya lost French Open girls' champion Spanish Paula Badosa Gibert in the final. In 2016, Kalinskaya won the Girls' Doubles event at Australian Open, partnering Tereza Mihalíková. Kalinskaya debuted at the senior 2017 Australian Open.